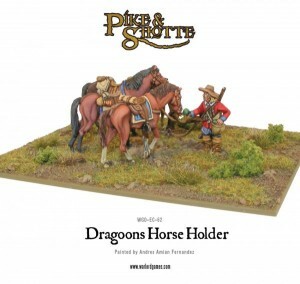 Warlord Games has their new Dragoon Horse Holder set from their Pike & Shotte line. Dragoons used different tactics than Cavalry. They acted in a scouting role, capturing bridges and woods, and their horses were treated with care and protected from harm, being used for transportation rather than in battle. Their long muskets were impractical to fire from the saddle (and tended to spook the horses), so the regiment would ride into position before dismounting.